Have you ever gone into the House of Mirrors at the county fair? Remember seeing your reflection change as you went from mirror to mirror? Sometimes you saw yourself tall and skinny, sometimes short and fat, and at other times your arms and legs were out of proportion? Obviously it wasn’t you changing from reflection to new reflection, but the mirror itself presenting a distorted view of who you were. The different curves of the mirrors gave unusual, funny, and at times grotesque images of your true self. Does your picture of yourself come from looking into carnival mirrors that will only reflect back a distorted view? The good news is that your opinion is not the last word! There is one true and unchanging ‘mirror’ – what God says about you. The Bible gives a clear picture of who you are, holy and without blame before Him in love (Ephesians 1:4; 1 Peter 1:16). It is what others say, the examples from Hollywood, and even past experiences that negatively define our self-image. A true reflection will line up with God’s opinion. The most effective technique for building a healthy self-image is developing the habit of repeatedly setting up mirrors that accurately reflect who we are, not just what we think we are or should be. What do you want to look like? If we’ve tried the mirror of the media, the mirror of our past, and the mirror of what others think, and only gotten a distortion, we need to consistently set up godly mirrors. Cultivating relationships that give us an honest perspective is a start. Studying God’s Word is also important if we are to learn about His plan for us and how to live with integrity. Another possible mirror is service. When we are actively helping others, we tend to see our blessings more. So how do you start to get rid of the distorted images? Here are four areas to focus on to change how you see yourself. Accept yourself as fully human, which means that you have both strengths AND weaknesses. To focus on the negatives, especially at the exclusion of the positives, is out of balance and unrealistic. The goal is to use your strengths, and to continue to improve your weaknesses throughout life. There will always be something to learn, some change to make, some growth to experience. If you see something in your mirror of life that you label as a weakness or ‘defect’, all it means is that you have room for improvement! Stop comparing yourself to others. Comparisons are the root of all inferiority. When you start to measure your weakness to other’s strength, your self-esteem will suffer. ‘I’m not as good as’, ‘not as smart as’, ‘don’t have as big of a house as’, or ‘as shiny a car as’ are all phrases that position you in a ‘lesser than’ role. While there is no problem with wanting to better yourself or meet your potential, when you attach a value to the characteristic, you are setting yourself up for distorted self-esteem. Ditch negative self-talk. Be careful of what you say – you may be listening. What we say absolutely has an impact on how we see ourselves. If we label ourselves with words like ‘loser’, ‘unlovable’, ‘worthless’, or similar words, we begin to define ourselves as that, and we begin to act like that. You would probably not call anyone the names you call yourself. Learn to be kind to yourself! Replace the negative words with more realistic and positive ones that reflect a more accurate image. Celebrate the unique creation of you. There is no one like you! You have a role that only you can fulfill. Before you were knit together in your mother’s womb, God already knew you. He knows the number of hairs of your head. He has a plan for your life. Regardless of your current circumstances, you are important. Find out what special skills, talents, and gifts you possess, and then use them. The good news is that change is possible! The mirrors that once only reflected back pain and condemnation can be replaced with ones that accurately reflect the truth about who you are and how wonderfully you have been made. 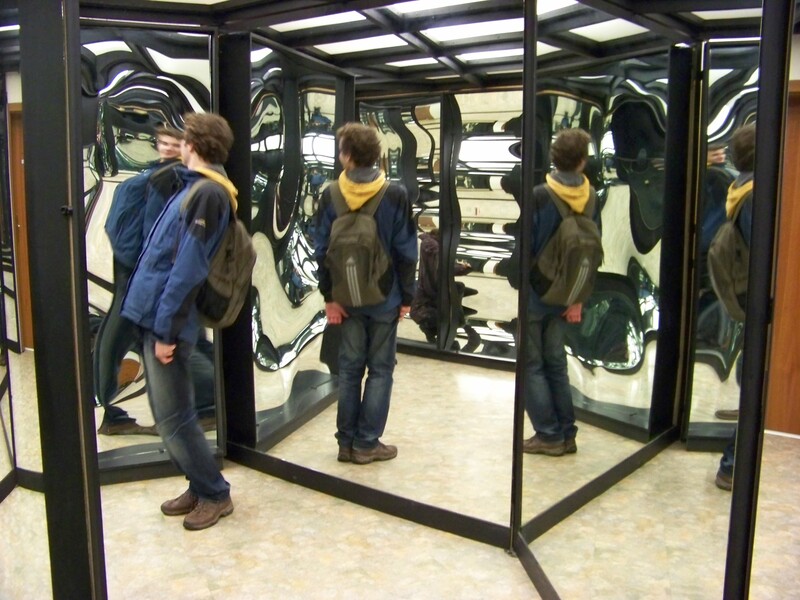 Just like being in the House of Mirrors, you can learn which life mirrors are distorting the truth and which ones are true. In doing so, you will open more room in your life for joy. Your potential is unlimited – life will never be the same when you see yourself as God does.